Forgive me for abusing the following line from rock history. That is probably the most accurate way to begin describing the Line 6 M13 Stompbox Modeler, a massive chunk of metal with lots of the things that guitarists love more than many things: knobs and switches. At first glance, you might think you are looking at a commercialized version of one of Steve Vai’s custom switchboards, and on the surface there are some similarities. So what does this insane block of metal do? Well, a better question would be ‘what doesn’t it do’. The M13 is essentially (and for lack of a better definition) an entire arsenal of stompbox effects crammed into one evil machine…over 75 stompbox effects to be exact, including a fully-featured looper, distortions, delays, reverbs, modulation effects, compressors and filters housed in an all-metal housing and designed with the ease of use that you find with your favorite pedals. And with the built-in chromatic tuner, you can sound good AND be in tune (even if your style doesn’t necessitate it…). The Line 6 M13 also has the ability to store up to 12 presets (known as ‘scenes’) for instant recall of your signature sounds…which is great, because it’s easy for someone to get lost in the huge forest of potential sounds that the M13 gives you. Fortunately, you can also save these ‘scenes’ to your computer with the built-in MIDI in/out. 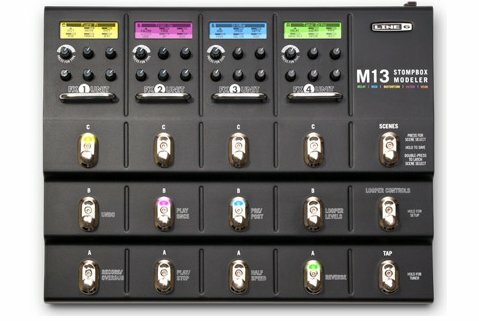 In addition to all of the features mentioned, the M13 also has two expression pedal jacks for even more tonal control. Or lack of control…either way works. Hey, guitar players like variety. Oh, and this massive beast will also fit on your pedalboard. Nice, eh?